Karn, Teferi, Jaya, Multani—they're all here, plus new mechanics, Standard-warping reprints, and a game-changing Enchantment subtype: Sagas. 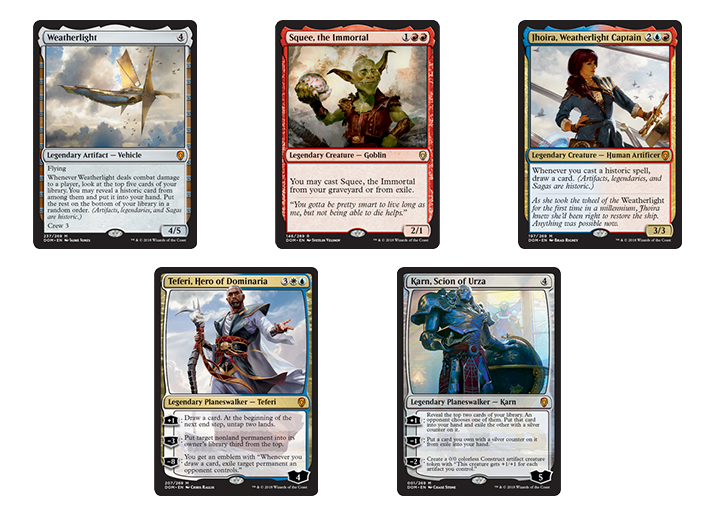 There's a legend in every Dominaria pack, which means a ton of new legendary creatures to build around for Commander and Brawl, the new Commander variant using Standard-legal cards. Of particular interest is the unique Buy-a-Box promo, Firesong and Sunspeaker. As you've hopefully heard by now, players can only get this card at WPN locations, and they can get it one week early at Prerelease. If you haven't yet, talk to your Prerelease distributor about ordering advance Dominaria displays (in quantities equal to the Buy-a-Box promos you receive). Even Modern players want to play it. I'm breaking my back to find a way to play it on WR Modern Burn (with Lightning Helix etc.) I know it's 6 mana but my god, I wanna play it so bad. 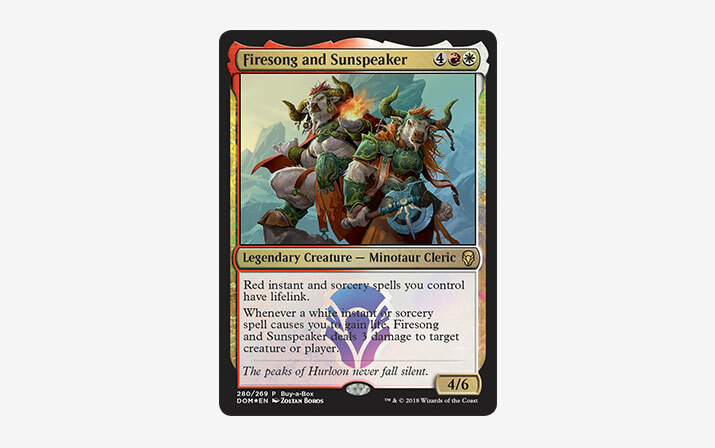 There's also a full cycle of two-color legendary creatures, a smattering of three-color legendary creatures, and a legendary Angel lord that are sure to shake up the Commander scene. I saw the spoilers today, got to be said, I will be buying a lot of the set for [Commander]. Even brainstorming whole new decks on the legendaries revealed. Tribal is always a popular theme in any product and there's no exception here. Llanowar Elves—perhaps the most impactful reprint of the set—returns to Standard in grand fashion and players are understandably excited. Even the Dragonmaster himself, Brian Kibler, is all aboard the hype train for Llanowar Elves. I'm not even kidding that the leak of Llanowar Elves in Dominaria is the reason I looked up the date and location of the Pro Tour. So what's good in Standard that will get better with Elves? 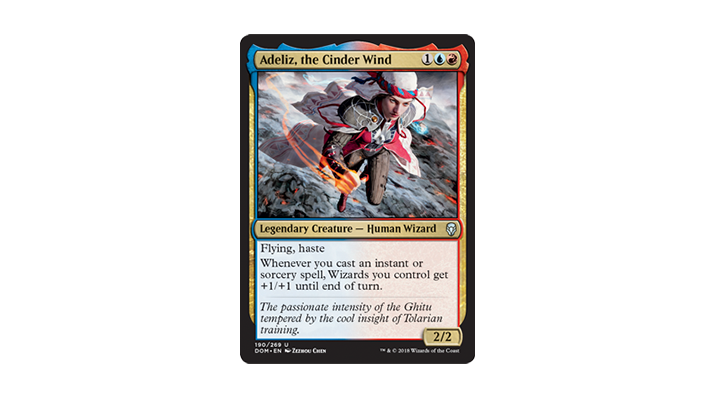 Personally, I'm most excited for the new additions to the Wizards tribe, including a potential new commander and Wizard lord: Adeliz, the Cinder Wind. I'm seriously going to use the wizard-heavy theme of blue for this set to build my wife a kick-arse [Commander] deck. 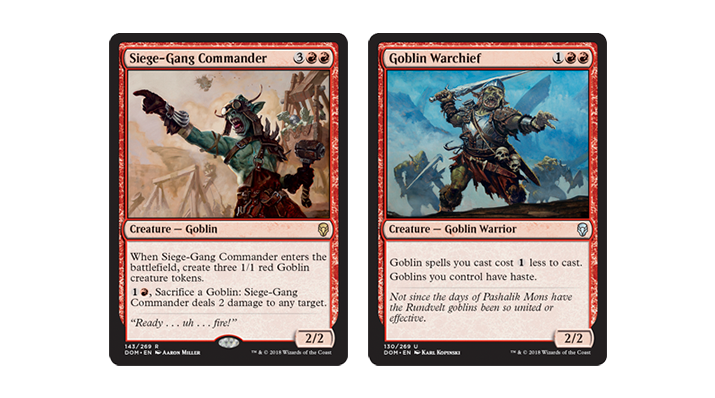 Siege Gang Commander leads the Goblin charge in Dominaria, followed closely by Goblin Warchief—now Modern-legal for the first time. My boy Siege Gang Commander… sniff… missed ya bud… and you brought your friends, welcome home. Possibly the # 1 demand-driver for Dominaria is for the sheer volume of flavor and nostalgia. The set is full of references and callbacks to prominent Magic lore from the many sets that took place on Dominaria in Magic's early days. Iconic characters like the immortal goblin, Squee, plus Karn, Teferi, Multani, Jhoira, and even the Weatherlight itself are all in the set. At first glance, Karn looks really strong in the right deck. Goblin Warchief in Modern is going to be fun. Llanowar Elves is a game changer in Standard and Wizard Panharmonicon!!!!!! There's also a new Enchantment subtype devoted to the lore and history of Dominaria: Sagas. 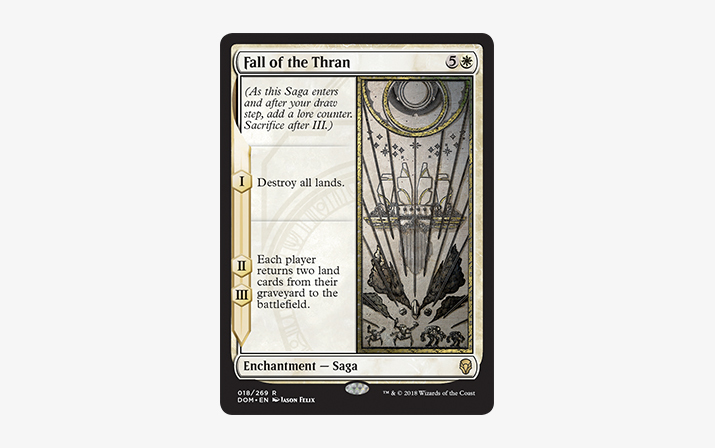 Even its layout is designed to feel like ancient, historical scrolls that depict a legend from Dominaria's past. Sagas look SO cool. Love the art… style? Theme? If they're all like, cool "tomes" they're going to be beautiful to play. There is something for everyone in Dominaria and community hype for the set is at an all-time high. Call your distributor to place or boost your preorder today.